Northern Supercar Hire offer a wide range of Supercar Hire options for Self-drive hire in Scotland. Established in 2006, and with many delighted Supercar Hire customers, Northern Supercar Hire is the company you can trust to organise your Supercar Hire in Glasgow and throughout Scotland. We can deliver your chosen Supercar to Glasgow for a weekend of luxury and style in one of Scotland’s thriving cities. Glasgow is a beautiful city steeped in culture and history, perfect for a long weekend break in a Ferrari, Aston Martin or other thrilling performance car. 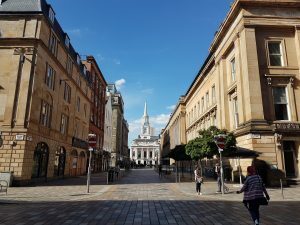 Not only is Glasgow is the perfect base from which to explore Scotland, Glasgow also offers a chic and appealing city break. Why not take your Ferrari Hire or other Supercar Hire to the Glasgow Transport Museum, now in the Riverside Museum? Here you will find an enormous selection of the world’s most interesting cars, bikes, trains, trams and ships. If it moves, the Glasgow Transport Museum has it! Park your Supercar Hire in the vast carpark outside, and prepare to become part of the experience. The Glasgow Science Center also offers interesting interactive exhibits. Some of our Supercar Hire customers in Glasgow enjoy the Glasgow Tower, which offers panoramic views of the city. Use the experience to pick out where you’d like to drive your dream Supercar Hire in the afternoon. Glasgow offers stylish shopping opportunities for the discerning shopper in the famous ‘Style Mile’. Those interested in fashion and beauty will enjoy perusing Glasgow’s Buchanan Street, Argyle Street and Merchant City. The West End has unusual, more avant-garde shopping options featuring ladies and men’s fashion and home designers. Back to the real driving opportunities in your Supercar Hire in Glasgow – head out of the city and out your Supercar of choice through its paces in the gorgeous scenery and landscapes around Glasgow. You really don’t need to go far to experience stunning coastlines, mountains and historical sites. We would recommend a day trip to Stirling, a beautiful city with a fantastic castle to enjoy. Benmore Botanic Garden set in the rugged hills to the North of Glasgow. Argyll Forest Park is close by, offering pretty countryside and footpaths for those wishing to stretch their legs. Nearby Loch Lomond offers beautiful scenery and viewing points. Northern Supercar Hire would recommend staying at Mar Hall Golf and Spa Resort in Glasgow. This luxury hotel offers stylish elegance and luxury to visitors. Call Northern Supercar Hire today, your local Supercar Hire company. Northern Supercar Hire is the company you can trust to organise your Supercar Hire in Glasgow. We have a wide range of Supercars for Hire and are Aston Martin Hire specialists.